Welcome to Memory Lane on the Santa Ana River bicycle trail. 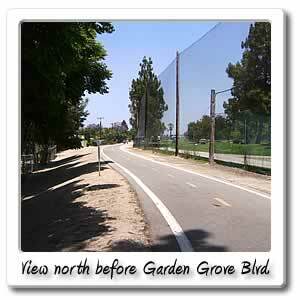 About a mile north of Seventeenth Street will take you to the Garden Grove Blvd./ Memory Lane entry/exit point. 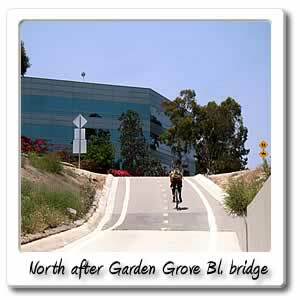 If heading north on the trail, the first exit at the bridge, will take you east into Santa Ana, and barely a 1/4 mile later, you'll be at Bristol Street, there you'll find a Subway, Starbucks, donut shop and some other stores at that one corner. If you continue to head north on Bristol, it will turn into La Veta, and you'll be heading over the 22 freeeway and the 5. About a mile after you pass over these freeways, will be Main Street and at that intersection is St. Joseph Hospital in Orange,and if you go 1/4 mile south on Main Street, that will take you to Main Place Main in Santa Ana. 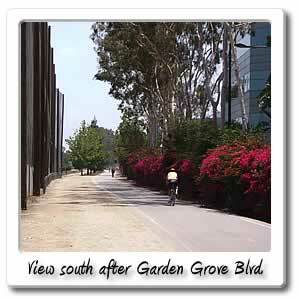 On the side of the Mall is a mile long trail called Santiago Creek Trail, it runs west and east from Main Street to Glassell Street, at which at that point, you will be at Hart Park. 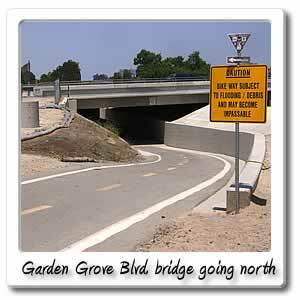 By going under the bridge, and heading off of the trail you will be in Orange on the border with Garden Grove, at this time you will be on Garden Grove Blvd. Less than a half mile at Lewis Street, will be a Taco Bell, liquor store, and 7-11. But if you go 1/4 west off of the trail, will be The City Drive, by going less than a half mile up this street, just after the 22 freeway, will be the Shops at Orange, right outside of the mall area, is a Carl's Jr., El Torito and Krispy Kreme. Across the street from that is a family and juvenile courthourse. Theo Lacy jail is behind all of those buildings. In the mall itself is a movie theature, department stores, skate park, Starbucks, Dave and Busters, and other shops and stores. 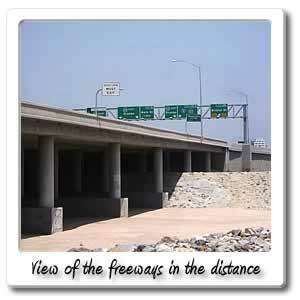 Heading north on the trail, a little more than a mile away is Chapman Avenue, but before you get there, you will pass under the 22 freeway, and then half a mile later the 5 freeways, which don't have any entry or exit points, near them.